When you Join in our Pilates classes will you will be empowered to discover your inner strength, transform mind and body inside and out, increase your stamina, improve your health & physical well being. Your body will totally transform from the inside out. Your energy level will increase dramatically. Chronic back pain and other debilitating physical ailments will decrease significantly as your range of motion and mobility improves. 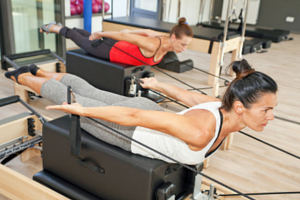 Our exercises follow the six principles of Joseph Pilates: Flow, Concentration. Breath, Precision, Centering, Control. Focusing on Correct posture placement, head, neck, spine, shoulders, core activation, rib cage placement, neutral versus imprint. Click on each image, which will open up in a new page with more information about each type of Pilates & history. Clinical Pilates – is a form of exercise and rehabilitation that combines Pilate’s principles that teach you to improve your core stability through the isolation of specific muscle groups. 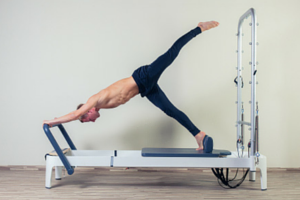 Reformer Bed Pilates – is working with the core muscles that support and stabilise your spine, back and hips. 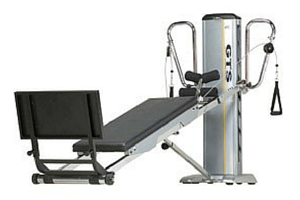 This enables you to do a sit-up, get out of a chair or straighten up after bending over. 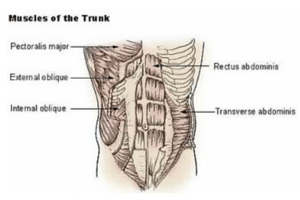 If your core muscles aren’t exercised regularly, they become weak. 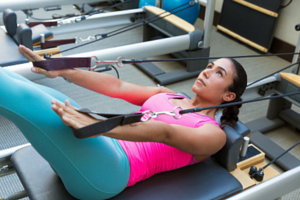 Pilates for Rehabilitation – Our rehabilitation programs are designed to speed the recovery of soft tissue injuries and other challenges when rehabilitating the body. Power Pilates – is where we teach you to connect with your core muscles which completely change your body shape as well as strengthen your body dramatically! 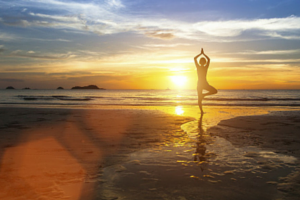 Yoga-lattes – is the combination of both Yoga and Pilates. We create varied workouts that are fun efficient and challenging for your body. We target all areas of your body strengthening, looking to shape those areas through an exercise routine that is designed around your individual needs and goals. History of Pilates & Principles – Created by Joseph Hubertus Pilates 1880-1967. Pilates is a sequence of carefully performed exercises designed to develop your deep torso muscles and improve flexibility, muscle tone and body alignment.